A000939 Number of inequivalent n-gons. Here two n-gons are said to be equivalent if they differ in starting point, orientation, or by a rotation (but not by a reflection - for that see A000940). S. W. Golomb and L. R. Welch, On the enumeration of polygons, Amer. Math. Monthly, 67 (1960), 349-353. A. Stoimenow, Enumeration of chord diagrams and an upper bound for Vassiliev invariants, J. Knot Theory Ramifications, 7 (1998), no. 1, 93-114. Eric Weisstein's World of Mathematics, Hamiltonian Cycle. Gus Wiseman, Inequivalent representatives of the a(6) = 14 cycle necklaces. Gus Wiseman, Inequivalent representatives of the a(7) = 54 n-gons. For formula see Maple lines. 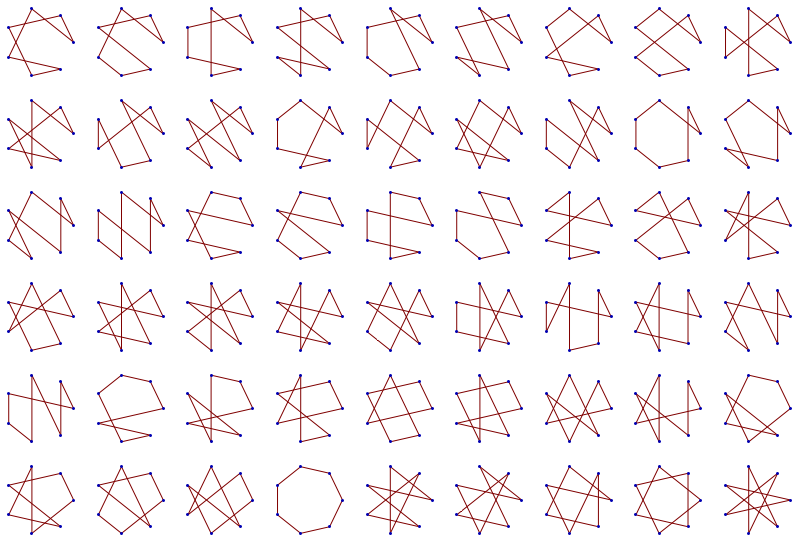 Possibilities for n-gons without distinguished vertex can be encoded as permutation classes of vertices, two permutations being equivalent if they can be obtained from each other by circular rotation, translation mod n or complement to n+1. n=5: 12345, 12354, 12453, 13524.
n=6: 123456, 123465, 123564, 123645, 123654, 124365, 124635, 124653, 125364, 125463, 125634, 126435, 126453, 135264. Cf. A000940. Bisections give A094154, A094155. For star polygons see A231091. Cf. A000031, A006125, A008965, A059966, A060223, A192332, A275527, A323858, A323870, A324461.